Every arrival of a New Year feels like an opportunity to be grateful for all that has come before and to begin again to touch the lives of others in a positive and meaningful way. I know I feel the exhilaration of that new beginning each new year brings! How’s this working for you? If you’re like me and this whole process ultimately leaves you feeling like a worthless failure, read on. I can suggest a better way for all of us this year! How many of us make resolutions for the new year? I did for years. And they were always blown before February. I’m a member at a gym and it’s a standing joke – here comes the January rush. It’ll be over in two weeks. So how do you feel after you’ve gathered your resolve and vowed to use all of your willpower to carry through with your New Year’s resolutions this year? This year’s your year, right? A resolution is defined as a “firm decision to do or not to do something.” A firm decision. I don’t know about you, but there’s not much in my life that’s definite. I honestly don’t always know what I’m doing when I wake up in the morning. Maybe I thought the boys were going to school and then somebody’s sick. And then the whole day shifts in no time. Sounds like a set up for failure to me. So what’s a girl to do? Don’t we all thrive on success? I know that failure doesn’t do a lot for my motivation, and I bet it doesn’t do much for yours. So last year I learned how to set myself up for success. Last year, I decided that one of my goals was to take risks. To do things that were uncomfortable for me. And I reached that goal in spades! I started this blog. I barely knew what a blog was…but I took the leap and the rewards have been immense. I’ve met and made so many new friends and The Midlife Mamas has pushed me to take so many risks and learn so many new things. So my goal was a large, overarching, category: take risks / dare greatly. I can be successful at this goal every single day. Small successes most days motivate me to keep daring greatly. Every day there are so many chances to step outside my comfort zone! I reached my goal in tiny steps, almost every single day! I think of this as identifying a path that I want to travel. This path has steps along it that are available for the taking every day. So my path/goal for 2015 was to put myself out there, to take risks, and to step outside of my comfort zone. So a New Year’s goal is a path that you travel more than a destination that you reach. Choose a path for the upcoming year. I’ve chosen mine for the year: make choices deliberately. I’m choosing a path of power – one where I act deliberately as often as possible so that I don’t allow myself to be carried along. The second alternative to New Year’s resolutions is a New Year’s opportunity. 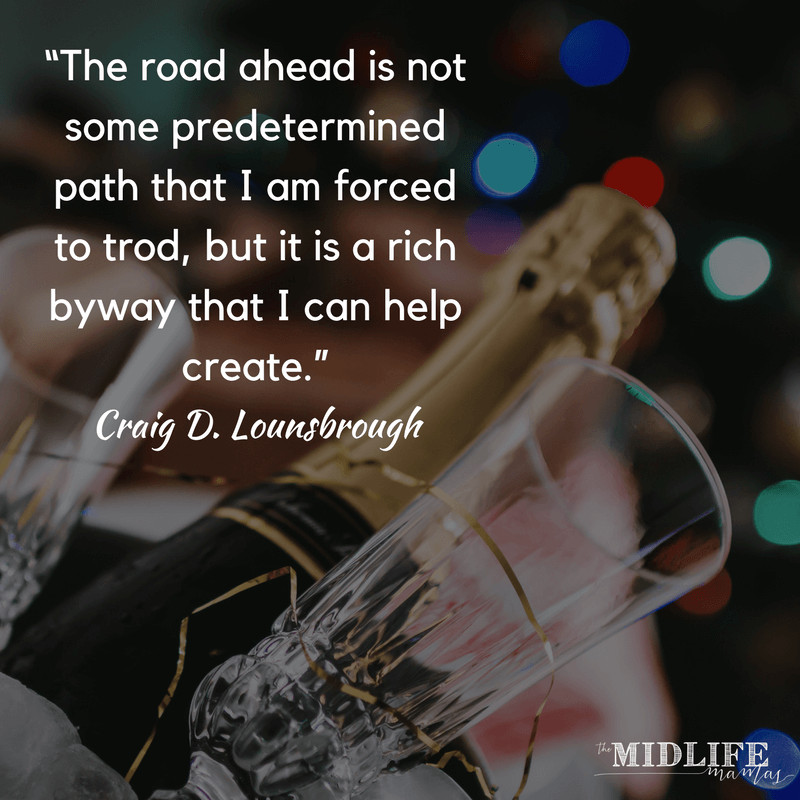 A New Year’s opportunity is a ton of tiny, baby steps – that will ultimately take you down your path. And closer is better than not closer. It’s progress. And progress is good. So by setting yourself up to take advantage of opportunities, you set yourself up for success. What if you decide to loose 15 lbs? We all know we’ll be chowing down on Kung Pao Chicken by the box and a pint of Ben and Jerry’s within a week. But what if, instead, you decided to take each opportunity that you had to add fresh fruits and vegetables to your diet instead of processed foods? Each opportunity would be a success!!! If you choose not to take advantage of an opportunity – it would be your choice. Looking at your goals as either a path or a series of tiny, baby steps can lead you to success faster and easier than making those New Year’s resolutions that so frequently lead to feelings of failure. Give it a try and let me know what your choices are for the New Year! PS – If you insist on making a resolution, this one’s REALLY good!